The fun earrings, bracelets, necklaces and clothes you haven’t been wearing lately can work wonders to revive your fashion style. So revisit what’s in the lower levels of your jewelry box and in the far reaches of your closet and you’ll notice how much you enjoy getting dressed again. Shops move merchandise around in their stores all the time to make it look new and enticing. That works for the jewelry, accessories and clothing you’ve collected over the years too. When you see your old favorite earrings, that big chunky bracelet and unique button necklace you use to wear all the time at the top of your jewelry box, the fun styles and bold colors will inspire you. Reorganizing your well-loved jewelry and wardrobe is a fun afternoon adventure. You can try everything on and it costs you nothing since you already own the jewelry and clothing you’re seeing again in a new light. It may also save you from an expensive shopping trip. Remember to share jewelry between friends too, I have several sisters who swap clothing and jewelry. Flowering Bead Bracelet shown above has colorful flower buttons and fire polished czech beads that gives you a fun pop of color. Fashionable girls will love this fun accessory. Big Flower Necklace shown above has purple and pink buttons combined in a unique design. This fun fashion accessory gives your style a daring bold look and brings a touch of diva glamour to your outfit. Diva Necklaces shown on the right have plunging layers of eye catching buttons that bring a bold edge to your style. Cool colorful buttons hang pendant style on long silver loops and adds interest to any ensemble. So impress everyone with your new original look. Searching for direction in your fashion style? Original jewelry creates an instant focal point for your look and a starting point to inspire you, and unique earring, bracelet and necklace designs created with bright bold colors are great for developing a color palette from. You can use these colors for the rest of your wardrobe with some variation to create interest. Original earrings, unique bracelets and fashion forward necklaces are great with neutrals, or an eclectic mix of everything, even 10 year old styles from your college or high school days can look sophisticated with the right jewelry pieces. If you have a limited amount of clothing in your closet, because you have a difficult body shape to buy for, or you just hate shopping malls, jewelry suits a very minimalistic approach to fashion as well. Which means less expense and less fuss to create a dynamic fashionable look. One-of-a-kind jewelry is not just for fashion forward mavens anymore. 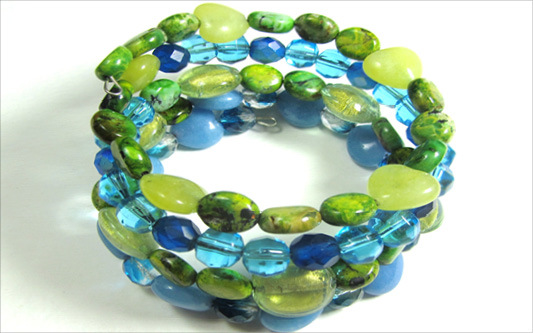 Colorful Darling Bead wrap Bracelet shown above is made with colorful semi precious beads like sea sediment jasper and jade in varying shapes and sizes, and fire polished czech beads, all on four full circles of memory wire. This is a jewelry design that glimmers with so much to look at. Drop Dead Fashion Earrings shown just above on the right are long drop dangle earrings made with fun flower buttons hanging from glamorous bold beads. You’ll look gorgeous wearing these stunning unique earrings that no one else has. Unique Button Girl Earrings shown on the right are cute accessories for girls and women. Flattering drop dangles have colorful fun shapes and only the most adorable buttons are used. Sassy handmade earrings are favored by adorable gals everywhere. I make handmade jewelry for women who have a growing appreciation for their fashion style and want to improve it. Women who realize wearing original jewelry is a fun sophisticated fashion forward way to enhance their style and how they feel. If you’re starting a fashion adventure begin with colorful original jewelry. When selecting one of a kind jewelry ask yourself, do you prefer bold colorful earrings, or long drop dangles; big chunky bracelets, or pretty flower bracelets; layered statement necklaces, or cute charm necklaces, or all of the above? When you’ve selected a few favorites then ask which jewelry pieces are more suited to your style. You can’t go wrong with picking the earrings, bracelets and necklaces you love above all others. Trust you gut feeling and put those jewelry pieces in your cart before someone else snaps them up. Vintage Style Flower Bracelet shown above has clusters of shiny flower buttons, glamorous fire polished czech beads, jade gemstones and crackle beads in a bold blue and purple jewelry design. Bring fabulous back with chunky chic fashion jewelry and be prepared for an influx of admirers. Glam Flower Earrings shown above and on the left have fire polished czech beads and river rocks hanging from glamorous flower buttons. These bold, fun earrings make your fashion style shine. Great wedding or special occasion drop dangles. A must have accessory for a gorgeous in demand fashion diva.